This booklet, published in 1998, is now (2010) out of print. This text is made freely available to be read and enjoyed by anyone interested in Kirk Hallam. Note. The page numbers refer only to pages in the printed book. Kirk Hallam is more than 700 years old. The Domesday Book records that in 1086 Gilbert of Ghent and Ralph of Burton both held land in Hallam. The book does not mention a church here, and the present church building dates mainly from the early fourteenth century. However, one or two features suggest that there may have been an earlier Norman church built in the eleven hundreds. What, therefore, is it that claims 1998 as its 700th anniversary? The answer to that is Vicars! In 1298 Simon de Radford was appointed as the first recorded priest for Kirk Hallam, it is this anniversary we are celebrating. I am intrigued that one of my predecessors was Robert Alastre who began his ministry in 1428. I guess that Alastre is an ancient form of Allestree, and that Robert originally came from that place. If so, then Kirk Hallam has had two priests who were born in Allestree: Robert in the fifteenth century and myself today. Perhaps you may think that is rather too much of a good thing! However that may be, there can be no dispute over the appropriateness of this book which has been compiled by Esther Collington. We owe to her and her contributors a debt for making sure that yet more of the history of our ancient village does not get lost in the mists of time. Thank you, Esther, and good reading everyone. From 1569 with Richard Seyrdan to 1748 with George Allen, all were curates in charge from St Mary’s Parish Church, Ilkeston. As you will discover from reading this book, only fifty years ago, Kirk Hallam was a beautiful, rural village, with a thriving farming community, very different from the present day urban suburb it now is. Mentioned in the Domesday Book, the village has a long historical past, having been owned by various notable families, and also having associations with the 19th Century novelist, George Eliot. Very little survives of the original village, just a handful of houses, the old school, some industrial archaeology, and, of course, All Saints Church, which this year, 1998, celebrates the 700th Anniversary of the appointment of its first Vicar, Simon de Radford, a monk from Dale Abbey. To mark the event, this Commemorative Book is published by the Parochial Church Council and the Friends of Kirk Hallam Church. The church has always played a large part in the life of the village, and this community spirit still lives on in the Kirk Hallamites of today, as we have discovered since appealing for memories of the village, church and people. Past and present villagers have contacted us from places near and far, with their offers of stories and photographs of life in Kirk Hallam. In addition to this publication, the festivities continue with a Medieval Fair which is to be held on Saturday, 11 July, 1998, and we hope that present day villagers will help us to celebrate this unique occasion in the history of Kirk Hallam. I was born in Kirk Hallam in 1920, and remember, as a child, when the village was a quiet little straggle of houses, cottages, farms, school, church and vicarage, each side of the narrow road leading from Ilkeston to Spondon. No bus service, public house, shop or Post Office; just a post-box in the vicarage wall, and village life centred around All Saints Church. Everyone knew each other, and there was a great deal of kindness and friendship. Concerts, whist drives, teas etc. were held in the village school before the wooden Parish Room was erected in the vicarage paddock in the early 1930's. The vicarage was built on the site of the old Kirk Hallam Hall, and stood behind the wall bordering on what is now Ladywood Road, and was surrounded by beautiful gardens, lawns, and a paddock. The coach houses which belonged to the hall were still standing, I remember, in: the early 1950's. 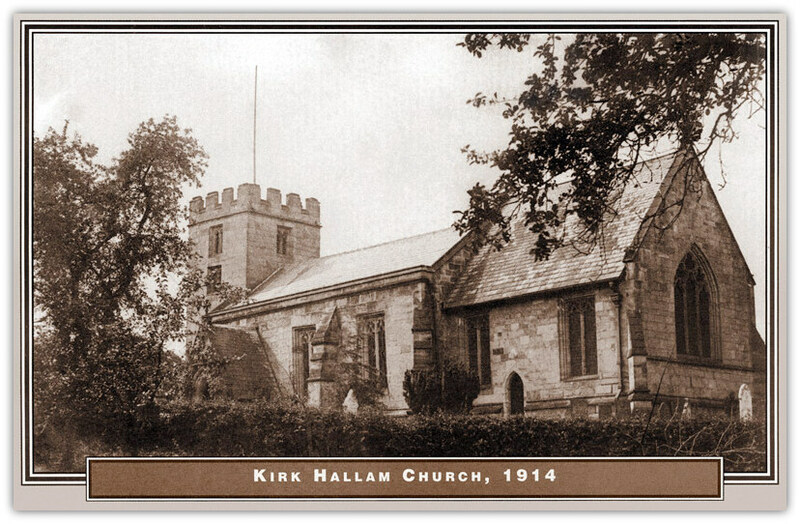 I was christened and married in Kirk Hallam Church, as were five of my sisters and both my brothers. Father was a church warden for a number of years, and on retirement was presented with a silver-mounted ebony walking stick. Mother was a very active member of the Church, and I would imagine one of the early members of Mothers' Union in the village. We all went to Church regularly as a family. I sang in the choir for a number of years, as did two of my sisters and my brother, who also rang the bells for services. The Reverend J. E. Dallimore (later Canon Dallimore) was Vicar, and a wonderful, caring pastor of his flock. We, as a family, were very blessed by his and Mrs. Dallimore's kindness on many occasions. They were loved and respected by everyone. Services at Church, principally Evensong, were very well attended, as was the Sunday School. Quite a number of people from outside the parish were very active, regular church members, and I think there were more young people in the choir and Sunday School classes from Little Hallam than from the actual village. 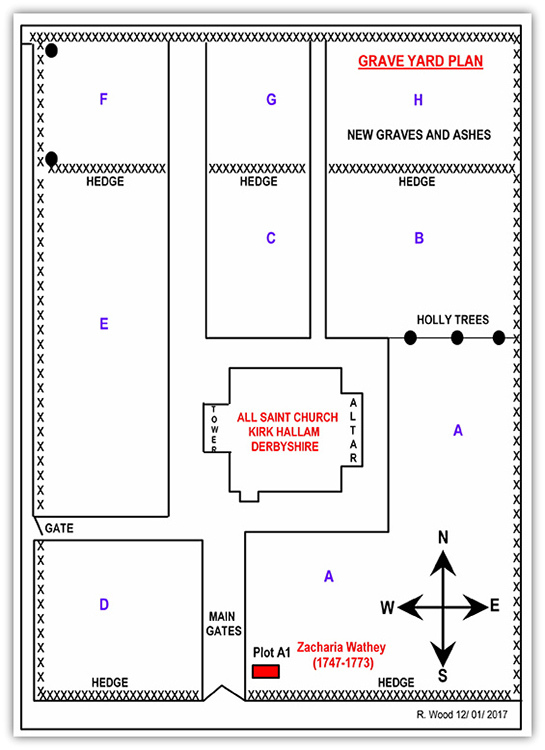 Services were very plain, 11.00 morning service, 6.30 p.m. Evensong, 8 a.m. Communion; also a service of Holy Communion at the 6.30 Evensong once a month for the benefit of the local farming community. The choir sat at the rear of the church, in front of the organ, which was played by Mr. Alan Clay; no robes were worn. There was always a good number of choristers, mostly young people, both male and female, and several men. Anthems were sung at Easter, Whitsunday, Christmas and Harvest Festival. This, of course, in a farming village, was a great celebration when the crops had been gathered in. The church was always packed, with chairs in the aisle, for the evening service. The font, our family responsibility, and the whole of the church were beautifully decorated with sheaves of corn, home-grown fruit, flowers and vegetables. Many new houses were built during the late 1920's and early 1930's; the road through the village became Ladywood Road, and Kirk Hallam became part of the Borough of Ilkeston. I remember most of the families from those early days: Strettons, later Pounders at the stone house beside the canal: Eatons, later Lathams at The Yews. Next was the school, with the little cottage behind where the Ling family lived. Two families named Allsopp lived in houses each side of the road, then the church and vicarage. Across the road was Spring Farm, owned by the Rices. Mr. Rice was sexton at the church for many years, and took great pride in the beautifully kept churchyard. The other side of Dark Lane (which would be where Welbeck Avenue is now) was Poplar Farm, farmed by the Wilkinsons, and across the road, next to the vicarage was the home of Mrs. Bramwell and her daughter Mary. Mrs. Bramwell was the headmistress of the school, a very strict, austere lady. Along the road was Hall Cottages, the home of the Carriers, then Vine Farm, my own home, and nearby the roadside duck pond. A short way along was Stirland’s bungalow, with the Boswell’s bungalow at the top of the hill, and the Crook’s and Derbyshire’s houses over on the other side. Bunkers Hill, a row of cottages, stood at the edge of the village, and almost beyond the village, on the way to Spondon, was Ladywood Farm, owned by the Parkins. Also, at the other extreme end of Kirk Hallam, up Dark Lane and along the bridle road, past the spring with its little brick-built house, to Stanton, was Sowbrook, farmed by the Bloods. As I have already mentioned, several regular churchgoers lived outside the actual village, mostly in the Little Hallam area: the Cope, Wilkinson, Grose, Cholerton and Maltby families come readily to mind. Other memories of days long gone are Garden Parties on the vicarage lawn, and Sunday School tea parties, with sports, in the paddock. Miss Dallimore produced excerpts from "Midsummer Nights Dream" one year, on the vicarage lawn, and a scene from the Mad Hatter's Tea Party on another occasion. This was for some kind of Sunday School Festival, held in Ilkeston Town Hall. The Parish Room became the focal point of village activities prior to the start of the war, with whist drives, teas, and meetings of various groups, and a regular dance which was very popular. Mrs. Carrier and Mrs. Latham encouraged shy young people to dance, and Miss Buxton played the piano for waltzes, military two-steps, mazurkas etc. On New Year's Eve there was always a special dance after which, on the stroke of midnight, we sang Auld Lang Syne then trooped into church for Watchnight Service, with the bells welcoming in the new year. Of course, the Kirk Hallam of today is very different from the village of my childhood, with today's busy roads, constant stream of traffic, and the large estate, which now covers what used to be the three farms. Bridge House, Mr. and Mrs. Allsopp's house by the roadside, Spring Farm, Poplar Farm, Vine Farm and Bunkers Hill cottages were all demolished to make room for the new houses, shops, and public houses. The church, however, remains the same, unchanged by the passage of time, a haven of peace and a place of Christian worship and friendship, just as it was in those days which I remember so well. A very treasured memory is of February 10th, 1945, my wedding day. Ron had recently returned home from Italy after almost five years in the Middle East. After the service, a joyful peal of bells was rung by my brother Frank and Ernie Cope; this was the first time the bells had been sounded since the early days of the war, when ringing of church bells was to be a signal of the invasion by Germany. The ban had just been lifted, since the war was almost over and the danger no longer existed. The sound was therefore very beautiful to us all.